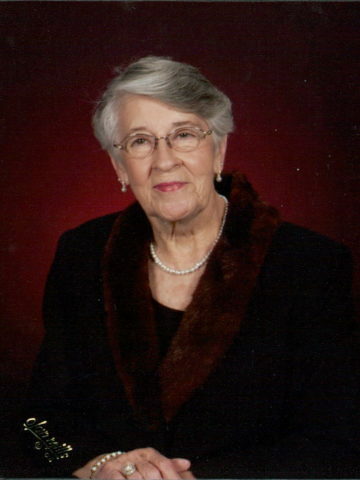 Sarah Armstrong Wood, age 85 of Springfield passed away on August 10, 2016. She was born on January 8, 1931 in Robertson County to the late Joseph Martin and Lovie Mai Savage Armstrong. She was educated in the Robertson County School System and attended Business School in Nashville, working at the State of Tennessee, U.S.F. & G Insurance Company and Cutters Exchange Inc. The company later sold to Singer Company in Murfreesboro in 1991. After retirement she enjoyed her days teaching Preschool. She was a member of Springfield Baptist Church, member of the June Burrs Sunday School Class and a part of the choir for many years. In addition to her parents, Mrs. Wood is preceded in death by her brother, James Armstrong and sister-in-laws Jean and Mildred Armstrong. She is survived by her husband of 51 years Robert B. Wood; brother, William “Bill” Armstrong; daughters, Dolores (Tony) Cassetty, Debbie (Carlos) Robertson, and Kim Robbins; grandchildren, Roy (Rhonda) Staggs, Charles Staggs, Samantha Staggs, Jada (Robert) Zeck, Jacqueline (Anthony) Hallman, Jamie Lynn (Paul) Thompson, J.W. (Jenny) Robertson, Grant and Clark Robbins, Alana and Alton Hallman; great-grandchildren, Meghan (Malcom) Meadows, Morghan (Dakota) Rawls, Mason Zeck, Trent Bibee, Neely (Jonathan) Duke, Josalyn Bibee, Chloe and Abby Thompson, Ashton and Isaac Staggs, Lexus Phillips; and great great-grandchild, Lathan Duke and Blake Hallman and numerous nieces and nephews. A Celebration of Life will be held on August 13th at 11am in the Chapel of Springfield Funeral Home with Brother Bob Carrol officiating. Burial will follow in Springfield Memorial Gardens with Mason Zeck, Malcom Meadows, Dakota Rawls, J.W. Robertson, Charles Staggs, and Anthony Hallman serving as pallbearers. The family will receive friends on Friday from 4-8pm then again on Saturday from 9am until the time of service. In lieu of flowers please make donations to the Alzheimer’s Association, 4825 Trousdale Dr., Ste 220 Nashville, TN 37220 or NorthCrest Hospice 100 NorthCrest Drive, Springfield, TN.